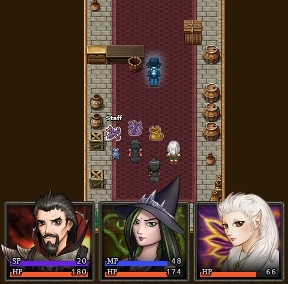 Aveyond 4 plays like a traditional turn-based RPG, with some twists. During battles, Boyle and his crew will go back and forth exchanging blows with enemies, and if your hit points run out, it's all over. Boyle, however, doesn't use mana... he casts spells view points that he earns each time he deals damage physically to an enemy, allowing him to regenerate his own spellcasting abilities. He'll learn more spells by catching small purple creatures throughout the game. (Because... because don't ask a lot of questions, that's why.) 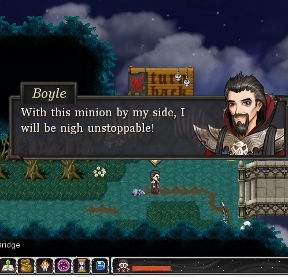 Boyle can also take a minion into battle. Minions don't do a lot of damage, but they can't be targeted by enemies, and they also have special abilities. The companions Boyle picks up also all have their own unique talents, like Ingrid, who can brew potions and learn spells by joining different covens. Aveyond 4: Shadow of the Mist is very much a comedic game, following Boyle as he's dragged kicking and screaming into accidentally doing the right thing time and again, regardless of his reasoning. Though initially a little slow to start, the game begins to shine once you leave Wyrmwood and pick up mischievous, mercurial mist wraith Myst as a companion. The core scenario of "bad guy doing good things" has been done before, but Aveyond 4 pulls it off extremely well thanks to its comedic tone. Boyle is kind of a dork, and that's the point, so his blustering and grandstanding is more endearing than annoying. (Hey, how can you not like someone willing to put their dog above everything else?) The game is absolutely lovely, with its detailed environments and expressive characters, and makes for bright and eye-catching visuals without going overboard... though the overabundance of bunnies and duckies in Aveyond proper is unintentionally hilarious. Not going to lie either... Ingrid gets 100% more adorable when you get to explore her house. The soundtrack is... there. It's alright. From an audio standpoint, Aveyond 4 has a few minor annoyances, like the scrabbling clack-clack-clack of footsteps that quickly becomes grating, or the tendency to fall completely silent save repetitive ambient loops, that make it hit or miss. As for its gameplay, Aveyond 4: Shadow of the Mist, is rock solid all around. The differences in character abilities keep combat interesting, while the lack of any real grinding (as long as you defeat the enemies you come across rather than avoiding them) keeps things moving at a solid pace. Outside of its main quest, a lot of its sidequests tend to feel like busywork, in the grand tradition of the genre, I suppose, though frequently the choices posed to you are purely superficial. Given how twisty some of the areas are, a map wouldn't have gone amiss, and neither would a sprint button to make running through them a little quicker. Despite these quibbles, however, Aveyond 4: Shadow of the Mist is easily recommended to just about anyone. It's engaging, clever, casual without being simple, and funny and weird in all the right ways. Even if you've never played an Aveyond game, this is the perfect place to start. Any help available? 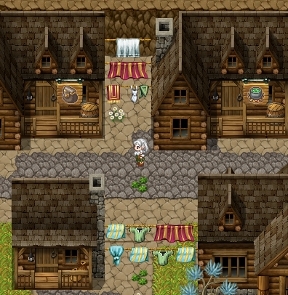 the Amaranth walkthrough is apparently without maps and not much use generally. Even though there is a guide available to buy, it leaves out some good information. I hope there is someone regularly reading posts here because if they are offering help, I am asking for it please as I am so stuck. As I said before, I am stuck. I am at the End of the world. I have introduced to the family, I have gone with the 'son' up to the well and gotten water. I picked up the purple creature, come down to the house and picked up the money. I can not get back into the house. The fence prevents me from going around and though I get the symbol to go in at the back of the house, I can't. Any suggestions? I had to do some dancing between keyboard and game board but got in. Now, I have made the agreeable portion only it turned blue. The book says I need to add fire but I don't see any way of doing that. The guide said I needed to get the broken violin from the arena. I get the hand icon when I put it over the violin but I can't pick the violin up. I would really appreciate some help. I figured it out both about the spoiler and hopefully, why I couldn't get the violin. I think I am back on track again. I am in the Dark Cave in Ginger Forest.I can't find the last locked room even i have the key.Anyone can help me? Does this Aveyond follow the same save-loading system from 1/2/3?